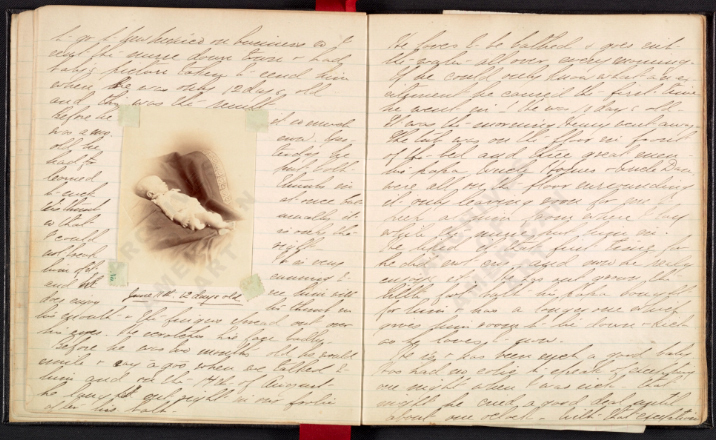 A Day in the Life: Artists’ Diaries from the Archives of American Art – September 26, 2014 to February 28, 2015, Lawrence A. Fleischman Gallery, 8th and F Streets, NW, Washington DC. 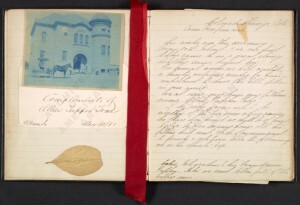 One of the diaries included in this exhibit is Allen’s mother Margaret Tupper True’s (1858-1926) diary. 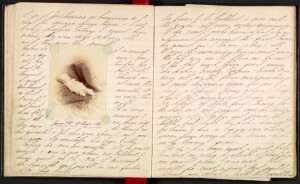 The majority of entries are written by Margaret, a few by True’s father Henry Alphonso (1837-1925) and other family members (identified as “Grandma” and “Auntie Min”). His mother faithfully recorded developmental milestones, illnesses, and other events from her son’s early years and pasted or inserted into the diary two photographs of Allen as a baby, a lock of his hair, a cyanotype of Franklin School in El Paso, Texas, a ribbon, and a leaf. 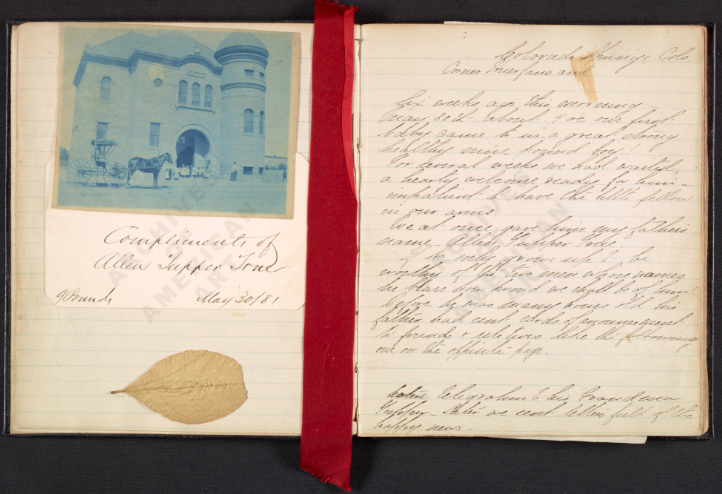 The diary forms part of Allen Tupper True and True family papers, 1841-1987 in the Smithsonian’s Archives of American Art. The touring exhibition Allen True’s West opened on November 12, 2010, and will run through January 9, 2011, in the El Pomar Gallery of the Colorado Springs Fine Arts Center Museum, 30 West Dale Street in Colorado Springs, CO. Victoria Tupper Kirby and her sister Joan True McKibben, both granddaughters of Allen True, attended the opening reception that was held on November 11 from 5-7 pm, followed by an illustrated talk and book signing from 7-8 pm by Victoria, co-author with her mother Jere True of the biography Allen Tupper True: An American Artist. Please click on the thumbnail photos to get the full image. 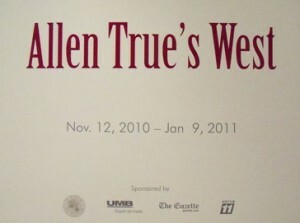 A banner for the “Allen True’s West” exhibit is hanging to the left of the entrance of the Colorado Springs Fine Arts Center. 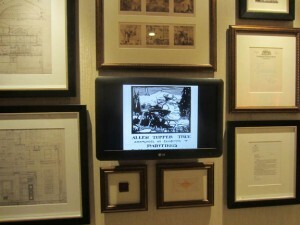 Exhibition signage is displayed on wall opposite the entrance to the gallery. 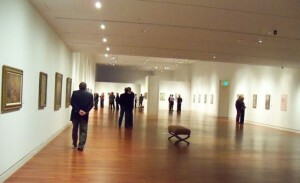 A section of the large El Pomar Gallery as seen from near the entrance of the “Allen True’s West” exhibit. 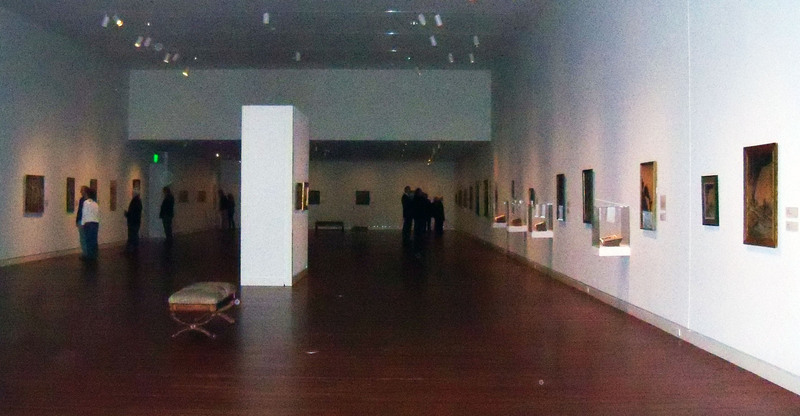 Another view of the El Pomar Gallery installation. Local collectors loaned these two landscape paintings by True to the exhibit in Colorado Springs. A view of St. Stephen’s Episcopal Church in Colorado Springs where Allen True and Emma Goodman Eaton were married on June 3, 1915 (now a part of Grace and St. Stephen’s Episcopal Church). The Fine Arts Center arranged a tour of the Historic Colorado Springs Nursery School on Friday, November 12, to see True’s “Mother Goose” murals created in 1922 at the behest of Alice Bemis Taylor, patron and daughter of the school’s co-founder Alice Cogswell Bemis. 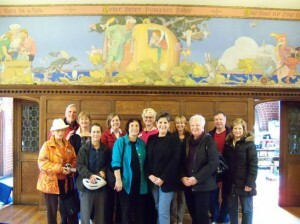 In the center of the front row is Diane Price (wearing black jacket and blue jeans), President. and CEO of Early Connections, which runs seven schools in Colorado Springs, including the Historic Nursery School. To her right is Victoria and to her left is Joan. 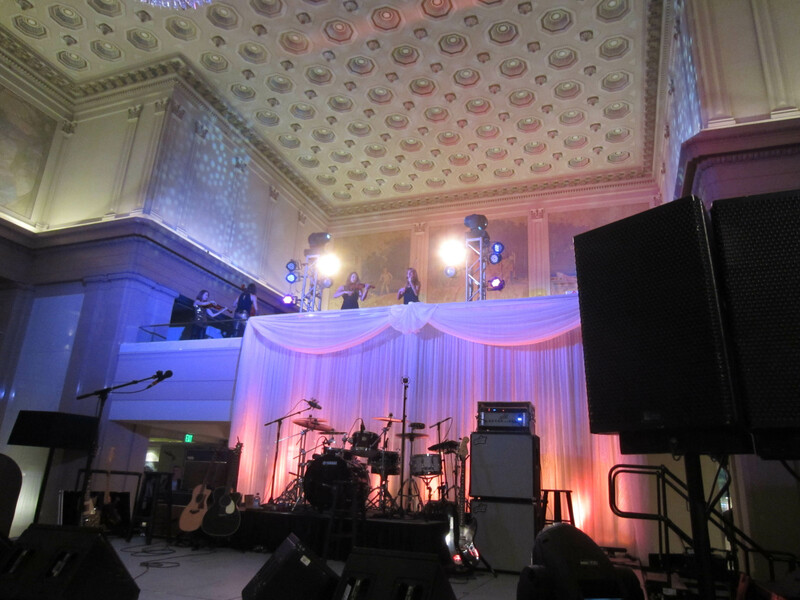 The murals wrap around the entire large room and illustrate over thirty “Mother Goose” rhymes. 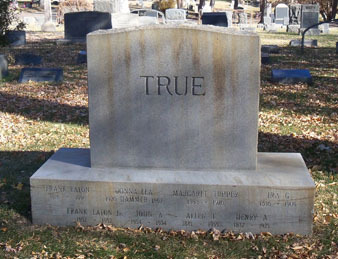 Joan and Victoria visited the True family grave site in the Evergreen Cemetery in Colorado Springs. 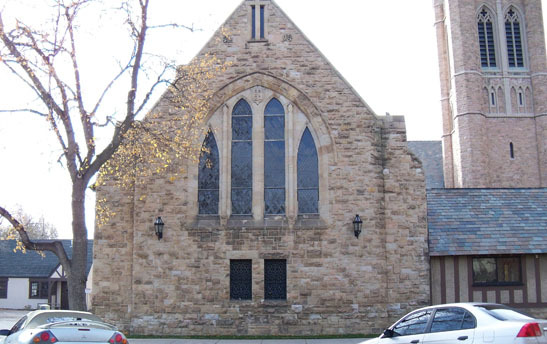 They learned that in addition to their grandfather, Allen True’s father Henry, his uncle Ira, his eldest son Frank and his first wife Donna Lea, as well as their two infant sons are buried there. In addition, Allen’s two sisters Margaret and Katherine and their husbands are buried in the plot. Here is a series of photographs taken by Victoria Kirby during her week in Denver (September 28-October 4) to give a book talk at the Tattered Cover bookstore in downtown Denver, and to the attend the premiere of the PBS special on her grandfather Allen Tupper True and openings of the three exhibitions of his work and life at the Denver Art Museum, Denver Main Public Library and Colorado History Museum. Please click on the thumbnail photos to get the full image. 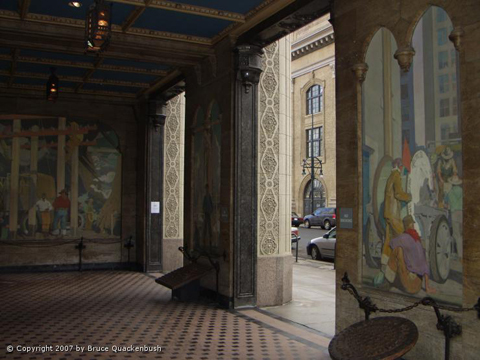 The last two photos were taken by Bruce Quackenbush of True murals in one of the entrances to the Quest building in Denver (formerly the Mountain States Telephone and Telegraph building). Several of True’s murals are shown in the entrance lobby of the Quest building in Denver. Due to a winter storm affecting the Oklahoma City area, the National Cowboy & Western Heritage Museum will be closed to the public Tuesday, February 1, through Thursday, February 3, 2011. In addition to the galleries, this closing includes Dining on Persimmon Hill restaurant inside the Museum, The Museum Store and the administrative offices. Please check back for additional closing announcements and/or special hours of operation. In addition, the free preview reception originally planned for Thursday evening, February 3, for the opening of “Allen True’s West” was postponed. Victoria Tupper Kirby says her grandfather taught her to fly fish, play chess and draw horses. She recalls less about his work in the studio than she does about True gently training the family dog. “He was a very patient man, my grandfather, with children and animals,” she says. But True was more than a loving grandpa. 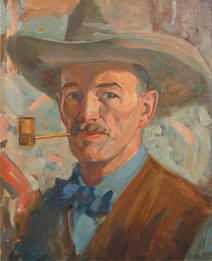 He was also an artist who studied under the prestigious Howard Pyle and counted N.C. Wyeth among his close friends. He illustrated books and widely read magazines such as Collier’s Weekly and the Saturday Evening Post. 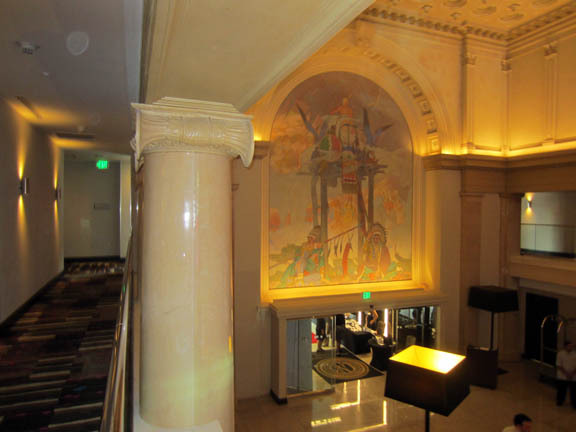 He was commissioned to paint murals in the capitol buildings of Colorado, Wyoming and Missouri, as well as many important locales in Denver: the library, the children’s hospital, several banks, the Brown Palace Hotel. He’s also credited with having designed the bucking horse and rider on Wyoming license plates. It could be that two of True’s three main art forms have often been seen as more crafty than lofty: illustration and murals. 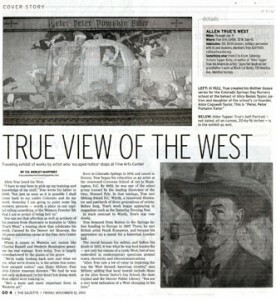 Allen True’s West, which opens Friday at the Colorado Springs Fine Arts Center, challenges this notion. This 40-plus-piece retrospective charts True’s career through illustrations, murals and easel paintings. Earlier this year, a larger version of the exhibit opened up north, spanning the Denver Art Museum (which organized the show), the Denver Public Library and the Colorado History Museum. 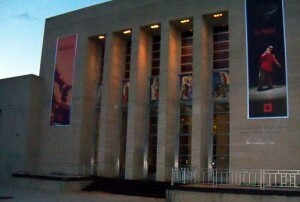 Though scaled-down, the FAC’s exhibit will feature some works that didn’t show in Denver, from local private collections. True’s Western roots run deep, says Kirby, speaking from her home in San Francisco. He came from a family of frontier people. His father founded the first general store in Colorado Springs, True and Sutton Grocers, which once stood on the corner of East Pikes Peak Avenue and Tejon Street. It was early American image-making, and True was at the forefront. He outfitted novels with stunning images of gunfights, river rapids and cowboys trudging through dangerous forests. In the exhibit, six books bearing True’s work will stand next to their corresponding original painting. Yet even True’s murals can assume a complementary role. One striking specimen, “The Commerce of the Prairies,” presents a lively blue-hued scene with dozens of men gathered to talk, play cards, play music and trade. For all the carousing within, the work appears faded; Milteer says that True commonly used a chalky palette so the mural would blend harmoniously with the architecture around it. “Commerce” highlights one of True’s most interesting qualities. He painted a border of sharp vines and flowers around the work, the flavor of which, more than Art Nouveau, is nearly Art Deco. In one work, True merged two seemingly disparate genres together. 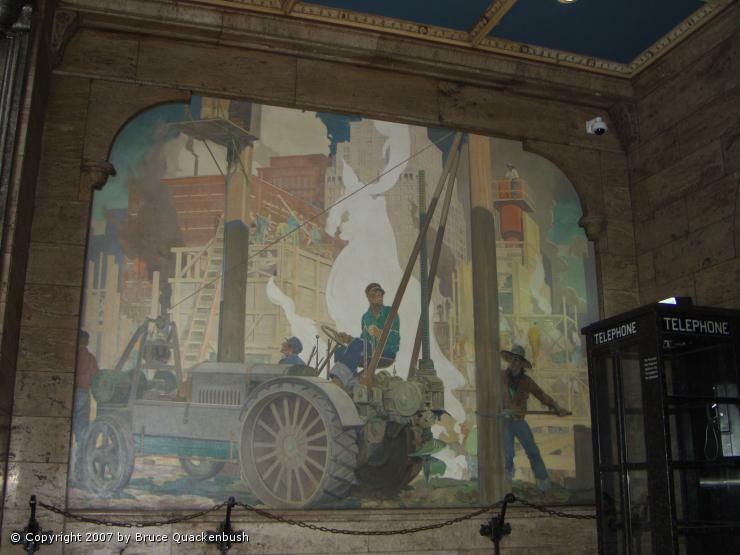 Later murals, such as those for the Colorado State Capitol and the Denver Telephone Building, feature broad, flat planes of color and smooth, expressive lines, far from the precise action shots of his earlier illustrations and the loose brushwork of his easel paintings. His style evolved, but then again, so had his muse. Unlike the artists before him, True saw modernity take over the region. Cowboys were no longer a memory, but a myth. Some of that technology came thanks to electricity and the telephone company. True’s mural study for 1927’s “Mountain Telephone Construction” shows crews erecting triumphant telephone poles while clouds toil above a mountain range in the background. Where there might have been a wagon stands the company truck. “[He] really depicts the development of the West, from miners to construction workers to telephone workers to Native Americans,” says Kirby. True’s devotion to the subject matter, says his granddaughter, was unabridged. She remembers not only him painting pictures up on a scaffold while she was sprawled on the floor, drawing, but also him giving presentations and writing articles on the wealth of inspiration that lay in the West. Now 70, and a singer and an artist herself, Kirby celebrates these memories in a book started by her mother, Jere True, called Allen Tupper True: An American Artist. Thanks to the book and the show, several of True’s murals have been saved or restored in Denver. Nov. 12 through Jan. 9, 2011, opening reception with a lecture and book signing by Victoria Tupper Kirby, Thursday, Nov. 11, 5-7 p.m.
Tickets: $8.50-$10, free for members, $5-$15 for reception; for more, visit csfineartscenter.org. 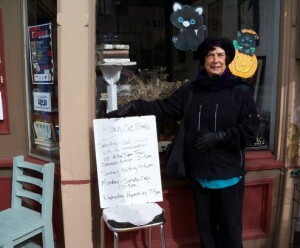 Saturday, Nov. 13, 2-4 p.m.
Free: for more, visit manitoubooks.com. 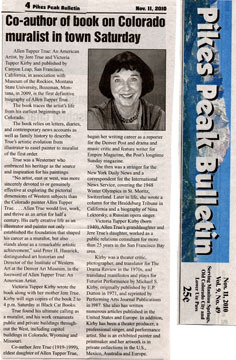 Where: Fine Arts Center, 30 W. Dale St.
Something else: From 2 to 4 p.m. Saturday, Victoria Tupper Kirby, co-author of “Allen Tupper True: An American Artist,” signs her book on her grandfather’s work at Black Cat Books, 720 Manitou Ave., Manitou Springs. Allen True loved the West. You can see that affection as well as artifacts of his journey from illustrator to muralist in “Allen True’s West,” a touring show that celebrates his work. Curated by the Denver Art Museum, the 42-piece exhibition opens at the Fine Arts Center today. When it comes to Western art, names like Charles Russell and Frederic Remington generate the real wattage. Even today, True is largely overshadowed by the giants of the genre. “We’re really looking back now and what we see, what we’re drawn to, is the artists that somehow escaped notice,” says Blake Milteer, Fine Arts Center museum director. “We find he was not only in demand (in his time) but doing work that others were looking to. 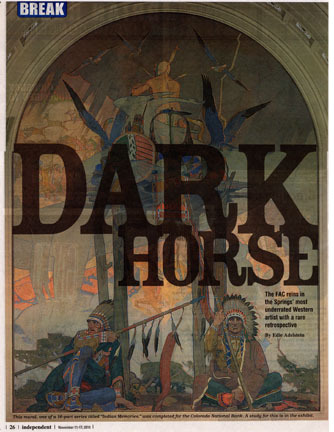 Born in Colorado Springs in 1881 and raised in Denver, True began his education as an artist at the renowned Corcoran School of Art in Washington, D.C. By 1902, he was one of the select group trained by the leading illustrator of the time, Howard Pyle. In that tutelage, True met lifelong friend N.C. Wyeth, a renowned illustrator and patriarch of three generations of artists. 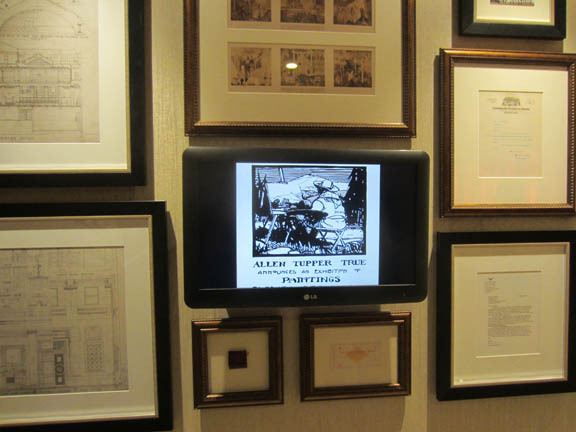 Before long, True’s work began appearing in magazines such as the Saturday Evening Post. In stark contrast to Wyeth, True’s star rose slowly. True bounced from Boston to the Springs before heading to Europe in 1907. There, he met British artist Frank Brangwyn, and became his apprentice on a mural for a historical London hall. The mural became his métier, and before his death in 1955, it was what he was best known for — not only his visions of a rustic West, but of one embroiled in contemporary questions around water, electricity and telecommunications. Allen True’s West opened on November 12, 2010, and will run through January 9, 2011, in the El Pomar Gallery of the Colorado Springs Fine Arts Center Museum, 30 West Dale Street in Colorado Springs, CO. A well-attended opening reception was held on November 11 from 5-7 pm, followed by an illustrated talk and book signing from 7-8 pm by True’s granddaughter Victoria Tupper Kirby, co-author with her mother Jere True of the biography Allen Tupper True: An American Artist. 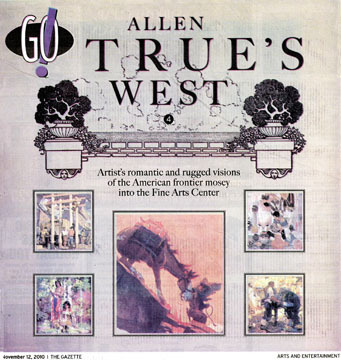 Allen True’s West is a touring exhibition organized by the Denver Art Museum consisting of 42 works ranging from original oil paintings and mural studies to periodical reproductions. The Fine Arts Center has supplemented its exhibition with three additional easel works borrowed from local collectors. Allen True’s West is sponsored by El Pomar Foundation, UMB Bank Colorado Springs, KKTV and The Gazette.